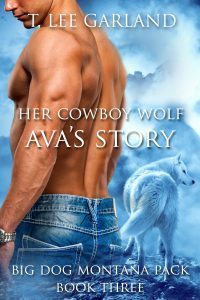 As the only daughter of Cliff Wright, the Alpha of the Red Wolf pack, life for Ava Wright should have been easy, but it was anything but. She has the ability to see into the future and that has caused a lot of suspicion in her pack. She is both feared and taunted and kept virtually a prisoner for her own protection. When he father leaves for a business trip and announces that she is to wed his second in command, Jace Pitts, Ava knows she has to escape her own pack, because she’s had a vision showing her who her true mate is and it’s not Jace. She’ll do what she has to do to get to her mate, including fighting Jace for her freedom. When a beaten and naked woman shows up on the streets of Big Dog, Montana, the Alpha to the Big Dog pack, River James is concerned, especially when he finds out she has the scent of a red wolf, one of their sworn enemies. However, once he meets Ava, he is stunned to find out she’s his mate. The woman he has waited for his entire life. She’s hiding secrets from him, dangerous ones. He only hopes she will learn to trust him enough to tell him the truth. When she does unveil her secrets he is surprised to learn she is Cliff Wright’s daughter and that she has visions, all of which are complications, but this Alpha swears nothing will keep him from making her is wife, even when her father and fiancé show up demanding her return. Ava and River will do what they have to do to be together. They will fight family, packs, and their own insecurities, but in the end nothing will keep them apart.